Growing your own vegetables is a good idea on so many levels. It’s convenient, you can be organic, you can grow far more varieties than you can buy in the shops, you can experiment with unusual varieties, it’s fun, and of course, it is a great money-saving option to grow vegetables yourself. All you need is an open well-drained plot, and even if that’s not an option, vegetables can be grown in containers, grow bags, and even window boxes. Therefore, large or small scale, it is nearly always possible to grow some of your own vegetables at home. Growing your vegetables – saves money, and tastes better! If seed is sown directly into the soil, good preparation is essential. Dig the soil in the autumn and again in early spring to remove stones and weeds. Then rake over until the soil is fine before sowing your seed as the supplier recommends. As sowing times and planting distances vary, it is important to follow the instructions on the seed packet. Store left-over seed, and seed you have saved yourself, in a cool, dark, dry place to use again or swap with your friends. Keep a diary to plan successive sowings of vegetables. Some will crop late, some early, but with careful planning you can make the most of the growing season and avoid shortages, gluts and lack of variety. In the vegetable garden, straight rows of plants are easiest to keep free of weeds that will compete with your plants for nutrients. Straight rows can be easily accessed to weed with a hoe. When you first start out, it is more useful to have a cold frame than a greenhouse to grow vegetables in. There are different benefits to growing in a greenhouse and a cold frame. If you can include both in your vegetable garden, so much the better. Root crops – include beetroots, carrots, parsnips, radishes, swedes, turnips and potatoes. Brassicas – include broccoli, brussel sprouts, cabbages, cauliflowers, kale and pak choi. Legumes/Others – include beans, peas, celery, courgettes, leeks, endives, lettuces, marrows, onions, spinach, leaf beet and sweet corn. Even if you don’t strictly follow a system of crop rotation, try not to grow the same thing in the same place for too long. Please take a look at my ‘Related Posts’ further down this page for more information on growing your own vegetables. 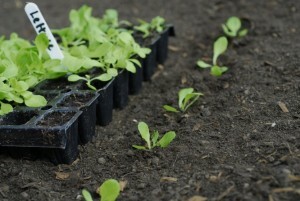 This entry was posted on Friday, March 2nd, 2012 at 12:46 pm	and is filed under Gardening Guides, Growing Vegetables. You can follow any responses to this entry through the RSS 2.0 feed. You can leave a response, or trackback from your own site.